What did you want to be when you grew up? Did you make a conscious decision, work for and eventually achieve that goal? If you, like me are a woman born in the first quarter of the 20th century, I'd wager your answer would be a resounding, "Heck, No!" The occupations open and acceptable to young women of my class and generation were service-oriented and circumscribed: one could be a teacher (probably not an administrator), a nurse (seldom a doctor), a secretary (hardly ever an executive) or a beautician who most likely didn't own a business any bigger than a shop in the back of her home. As a Depression-era young woman I had no greater dream than escaping my parents' home---by whatever means. I didn't see myself or my future in terms of personal success and fulfillment. I only hoped to live a bit better than I had when I was growing up. I was never forward-thinking in terms of my own development. I just wanted to survive. Despite being significantly overweight and under-educated I married thanks to propinquity and circumstance. During that marriage and due to necessity, I went to work in a menial position for a major corporation. After the war, political and social developments allowed me to rise to a point in my career I'd never imagined. But I worked very hard---my family depended on me. I retired successful and respected. However, to this day it's actually, still in my mind at least, all about surviving. Flash forward to 2008. 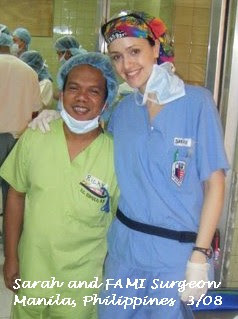 My granddaughter Sarah has just returned from a medical mission to the Philippines. She assisted in and performed over 600 surgical procedures in 12 very long days. 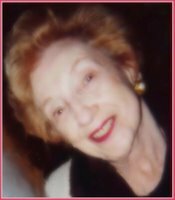 She went on this mission in addition to working full-time at the Manhattan Hospital for Special Surgery AND attending school full time. Sarah is 27 years old and has traveled throughout the world---at her own expense. She currently lives a few blocks from Central Park in NYC and has a well-educated and successful "significant other"---but feels no pressure to make it permanent as she says she isn't sure what she wants to do next. Oh, what a difference! Sarah works just as hard (or even harder) than I did at her age, but she isn't doing it to simply to survive. She's trying to make a difference in the world---because believes she can. She isn't worried about where her next meal is coming from or whether she should marry to ensure her future. She's secure. Her parents and I will take care of any dire emergency. Sarah doesn't need to hook up with a partner she doesn't feel completely committed to. She can devote herself to trying to make the world a better place and herself a better person. Lucky her. I so very much want to believe I would have done the same...but at least I can help her make these good things happen now...and believe I've done the very best I could with what I've been given. I know you must be exceedinly proud of her - as well as happy that she is in the position she is in. It is partly due to her hard work and partly because times have changed exponentially since you and I were young. I was afraid to follow my heart concerning a career and higher education and I am extremely glad to know that my daughters do not have to compromise!! I am glad I stumbled by your blog. We live oceans apart but I can identify with your musings of the past. Expect me to drop for a regular visit. I am ninety years old. I am glad to have found a company. I'll bet you would have led a "Sarah life" had you been born into a later generation. Maybe you just kept your light from shining out from under the lampshade those years. Your granddaughter is very attractive and sounds like she leads a good life. You are rightfully proud and bet she's proud of you, too -- also appreciative of the knowledge she has your support should she ever need it. Believe me, that means a lot to a young person, freeing them to make decisions, sometimes, they might be afraid to make otherwise in the interest of security. I came along in the decade after you. Where we lived at the time I was getting the same message you were, but as a senior in high school my older brother (a decade older -- well-travelled) told me there was more. That info sure didn't come from my high school guidance counselor. Even today, I have so many interests and often find myself thinking as I learn of opportunities, "Gee, I think I could have trained and succeeded in that profession." Think I'll try some of them in my next lives. Maybe you'll want to do the same, Lucy. Terrific post, Lucy. In my experience, each generation reaps the rewards of the previous generation's investments (time, energy, money). My mother sometimes protested over some little thing that I did for her. My reply was always that she should consider it the return on her investment. Good for your granddaughter! But I believe you WOULD be just like your grandaughter Lucy, where your circumstances like hers....Not hsving to struggle with survival issues in any era in made a difference for women and the cjoices they made....! This is a fantastic post, Lucy. Thanks for sharing this with us. I'm a bit younger than you and when I was in highschool, unlike my schoolmates, I didn't dream of having a husband and children. I thought I wanted to do simultaneous translations at the UN or the UNESCO. It turned out quite differently, but I consider that I was lucky to have graduated in 65 and to be able to lead my life more or less the way I wanted it. If our daughters and granddaughters now are freeer than we were it's thanks to the women who preceded them. Don't let's forget that! lucy, always a pleasure to drop by and catch up with you. delightful to read about sarah and your pride in her accomplishments. that's so important: feeling we've done all we could to make a difference for the ones who follow us. by the way, if sarah has spare time, there are many med students, residents involved with the effort toward getting Medicare for all. PNHP, physicians for a national health plan, has a nyc group that she may have heard about. It gets down to select a correct companion who uses your money in a right way - that is incorporate it in real business, and shares the profit with me. Very interesting to read that you also had the same motivation as I did...to move out of my parents' house...to marry someone with potential to earn a decent living...all done in the name of "survival." Following my heart didn't come until much later in life, but at least I finally earned that option. See my blog @ www.bevosblogo.com. Thanks for sharing your life.